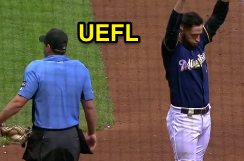 HP Umpire Quinn Wolcott ejected Brewers LF Ryan Braun (strike three call) in the bottom of the 7th inning of the Braves-Brewers game. With two out and none on, Braun took a 2-2 fastball from Braves pitcher Eric O'Flaherty for a called third strike. Replays indicate the pitch was located off the inner edge of home plate and thigh high (px -1.140, pz 1.659 [sz_bot 1.535]), the call was incorrect. At the time of the ejection, the Braves were leading, 9-3. The Braves ultimately won the contest, 11-3. This is Quinn Wolcott (81)'s first ejection of the 2017 MLB regular season. Quinn Wolcott now has 1 point in the UEFL Standings (3 Previous + 2 MLB - 4 Incorrect Call = 1). Crew Chief Tom Hallion now has 2 points in Crew Division (2 Previous + 0 Incorrect Call = 2). *Refer to UEFL Rule 6-2-b-1 (Kulpa Rule) for full ranges; px > .914 are in "always a ball" category. This is the 20th ejection report of 2017. This is the 7th player ejection of 2017. Prior to ejection, Braun was 1-3 (SO) in the contest. This is Milwaukee's 1st ejection of 2017, 2nd in the NL Central (STL 2; MIL 1; CHC, CIN, PIT 0). This is Ryan Braun's first ejection since April 21, 2013 (Phil Cuzzi; QOC = N [Balls/Strikes]). This is Quinn Wolcott's first ejection since March 19, 2017 (Rick Renteria; QOC = U [Balls/Strikes]). Wrap: Atlanta Braves vs. Milwaukee Brewers, 4/29/17 | Video via "Read More"